This Streetfilms video makes a great case for physically separated Bike Lanes. cycling in the Netherlands in the 1950’s! wow… check out this video I found on YouTube! I’m loving all the various types of bikes… and the old cars… circa mid 1950’s. notice all the groovy homemade trailers… the cargo bikes etc. kids form bike club to bike to school! 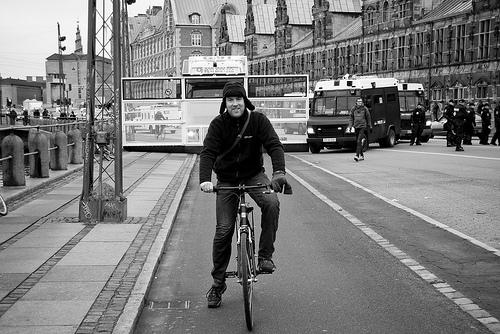 I found this link on www.copenhagenize.com this am… SO COOL! These kids formed their own bike club… and as a group they ride to school even though the city where they live has no infrastructure for bikes. I imagine that over time… movements like this will convince the powers that be to include more pedestrian and bicycle infrastructure. Notice how the teenagers are saying… why buy a car?! this comic is the first of several posts… delving into the cargo bike world… You have to admit… it is one hell of an obscure reference in a comic strip to feature a Bakfiets cargo bike. and the award goes to yehudamoon.com…. damn forward thinking of you! Thanks!